The PX8000 is an immensely versatile instrument, unlocking precision power measurement capabilities for researchers working on everything from renewable power to advanced robotics. Electric and hybrid vehicles have many electrical and mechanical components, and overall performance evaluation requires measuring the efficiency of both. 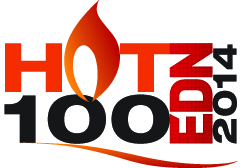 The PX8000's flexibility, accuracy and wide bandwidth make it ideal for drawing together the range of power readings needed to optimize the efficiency of boost circuits and inverters- two key elements in overall electric vehicle performance. Wide bandwidth With a 12-bit resolution, 100 MS/s sampling, and 20MH bandwidth, the PX8000 can be used for accurate measurement of inverter pulse shaped, which can then be used to fine-tune inverter efficiency. Transient measurement by cycle-by-cycle trend The ability to analyze cycle-by-cycle trends makes it ideal for the measurement of transient effects. When the load changes rapidly, engineers can gain insights that will enable them to improve the control of the inverter. 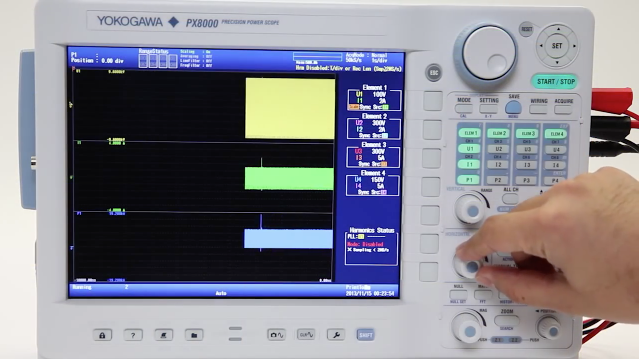 Harmonic and FFT analysis With both harmonic and FFT measurement capabilities, the PX8000 can measure fundamental waveforms from 20Hz to 6.4kHz. This is particularly useful for analyzing higher harmonic component and causes of noise in electromechanical systems. Offset cancels by individual NULL function A common problem when testing inverter motors is the presence of ambient noise that can mean test values are nonzero even before testing begins. 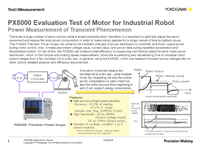 The PX8000's offset capabilities mean such effects can be nullified and specific inputs can be isolated for testing and analysis. A reactor is used to filter out noise and boost voltage levels prior to the use of an inverter. It consists of an electromagnetic material core and a coil. A main focus for electrical engineers is to reduce power loss across the total inverter system, and reactor performance is of particular interest. There are two potential evaluation methods: direct loss measurement of the reactor and iron loss measurement. The PX8000 supports either methodology because it can accommodate both high frequency measurement and low-power-factor conditions. 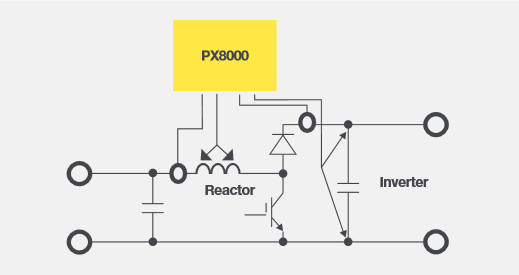 Low-power-factor measurement Higher sampling rates and broad bandwidth make the PX8000 particularly useful for testing devices, such as transformers and reactors that have lower power factors. It is particularly important to measure the precise power consumption of such devices at high frequency. De-skew functionality To analyze power consumption in low-power-factor devices it is particularly important to minimize any time differences between voltage and current caused by sensor input characteristics. The PX8000 provides precise de-skew adjustment to compensate for this time difference. Core loss measurement under high frequency Analyzing reactor core loss is an example of how the PX8000's user-defined functions can be utilized to provide an instant analysis of system performance. In the example below, core loss is calculated based on primary coil current and secondary coil voltage, while magnetic flux density (B) and magnetic field (H) are calculated by factoring in input frequency, cross-sectional area and other parameters. All values can be displayed directly by the PX8000. The development of wireless charging technology for mobile devices like smartphones and tablet devices is a focus for research. Automotive manufacturers are looking into the possibility of charging electric vehicles wirelessly. Wireless charging depends on two electromagnetic coils being configured to support particular frequency profiles. Efficient power transfer and the prevention of power loss are naturally particularly important. The PX8000 is ideally suited for measuring such systems because of its ability to operate at high frequencies and low power factors. Wireless charger efficiency evaluation To evaluate the efficiency of wireless transfer, at least three power measurement elements are required. The PX8000, with its four input channels, can analyze the performance of the whole system simultaneously. Low-power-factor device measurement Higher sampling rates and broad bandwidth make it ideally suited for wireless power transfer systems. 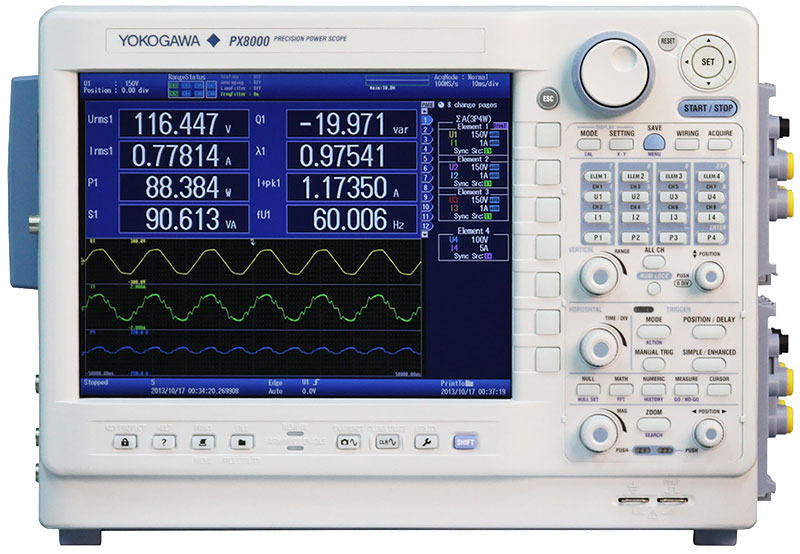 The PX8000 supports 12-bit resolution, sample rates of up to 100MS/s and a 20MHz bandwidth. 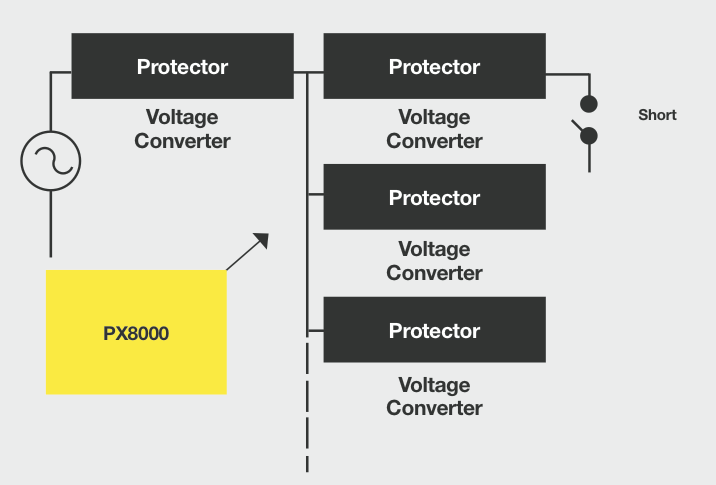 The PX8000 supports the measurement of low-power-factor systems operating at very high frequencies. 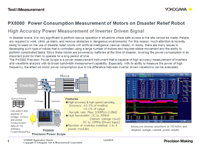 De-skew functionality Because the PX8000 provides a de-skew function, differences between voltage and current that are introduced by sensor and input characteristics can be compensated for and eliminated from the analysis of low-power-factor systems. Power distribution systems have to maintain constant voltage and constant power during load switching or in the case of a short circuit. Distribution protectors or circuit breakers for three-phase electrical systems must therefore be tested at transient voltage and power levels. The PX8000 can capture fluctuation voltage and current waveform, calculate power parameters (including voltage and current values), determine an average over a specified period and display all values. Simultaneous three-phase data capture To evaluate three-phase electrical systems, at least three power measurement inputs are required. The PX8000 has up to four inputs and enables the simultaneous capture and display of voltage and current across all three phases. Specific time-period measurement For a true evaluation of distribution protection, it is necessary to measure a full cycle of voltage current and power values half a cycle after the recovery from a short circuit. The PX8000 can easily be set up to focus on such a specific period. Harmonic and FFT analysis The PX8000 has capabilities for both harmonic measurement and FFT for frequency analysis. The harmonic function can measure fundamental frequencies from 20Hz to 400kHz, and FFT has 1k to 100k points calculation across two channels. Such measurements are vital for identifying harmonic currents and identifying sources of noises. To evaluate motor-driven robots, power consumption of all motors and controllers are measured throughout all operational speeds and action patterns. 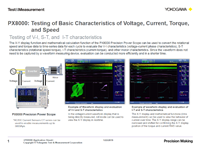 Design engineers need to measure inrush voltage, current and power over the pattern of repeated actions. Efficiency is calculated by comparing mechanical output with input power. During actual operating conditions, the time to accelerate and decelerate such motors can range from several hundred milliseconds to several seconds. As a PWM-driven motor rotates from the reset position to the top speed, the drive frequency from the rest position to the top speed, the drive frequency changes from DC to several hundred Hz. 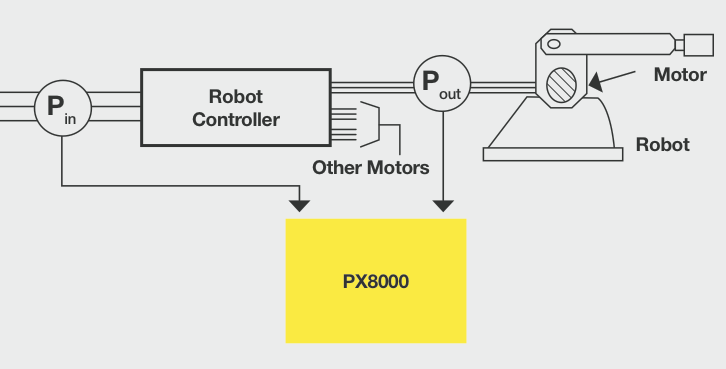 The PX8000 gives design engineers insight into power consumption and efficiency throughout a robot's operational performance. Specific time-period analysis Supports the measurement of waveform data between specific Start/Stop cursors. Combined with its multi-channel capabilities and its Long memory and History functions, this makes the PX8000 particularly useful in rating a robot's operational power consumption. 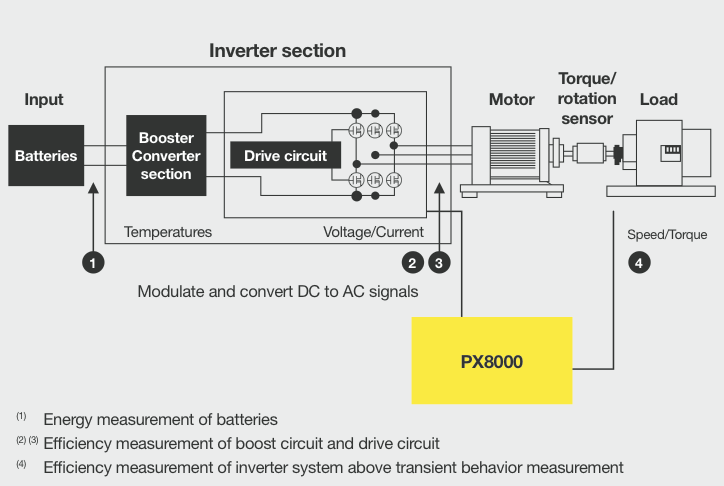 Efficiency measurement of boosters, inverters and motors A single PX8000 unit can measure both the input/output power of inverters and the mechanical output of a motor. By installing three power units and one AUX module, the PX8000 can be configured to provide an instantaneous measure of component efficiency. 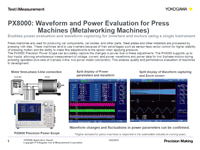 Transient measurement by trend computation With its instantaneous power calculations, the PX8000 is ideal for evaluation and optimizing transient effects. Its cycle-by-cycle trend analysis provides further insights into this crucial area of robotics engineering. Longer time-period measurement To analyze some robotic operations, it may be necessary to perform cycle-by-cycle trend analysis over a long period of time. The PowerViewerPlus software extends this mathematical capability to enable deep insights to be obtained from the data. The large internal memory of up to 100M Points enable long term measurements to be made at high and appropriate sample rates. A Power Module consists of one Voltage Module- Model 760811, and one Current Module- 760812 or 760813. 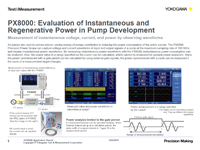 This white paper describes the PZ4000 power analyzer, a discontinued model that has been replaced by the PX8000 Precision Power Scope. The PZ4000 was developed for power measurement and waveform observation. 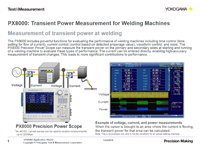 It features a trend display for the measurement of transient power and a span measurement function. 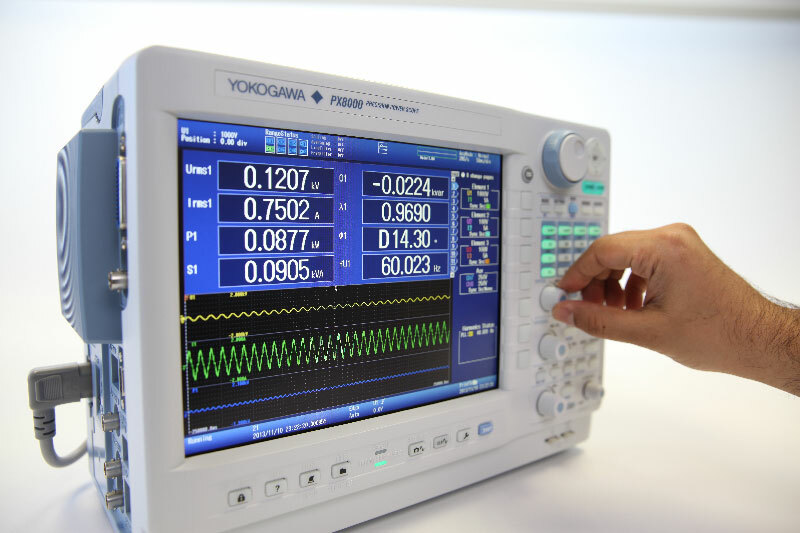 Despite having a wide bandwidth of DC-2 MHz, which facilitates the accurate measurement of switching control waveforms or fluctuating power and a fast sampling rate of 5 MS/s, it is capable of precise measurements at an accuracy of (±0.1% of reading +0.025% of range). It can analyze wide band distorted waveforms with a maximum of 5000 harmonic analysis orders.